Born in 1971 in Nicosia. After completing his military service (1988-1990) in the Cyprus National Guard, he attended and graduated from the University of Arizona in the USA in 1994 with a degree in Business Administration (Marketing). He received his Master of Management degree in 1996 from the Willamette University, Oregon, USA. Since 1997, he holds the title “Import Parts Specialist” after passing the exams of the AIA (Auto International Association - USA). 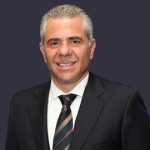 He has been participating in many conferences, forums and seminars in Cyprus and abroad, concerning the automotive aftermarket industry, the economy, business, etc. He has been working in the company since June 1996.